If you’re a developer or a UX person, unless you’ve lived under a rock for the last few years, you understand Responsive Web Design and it’s implications for site construction. It’s clever stuff of course, and there are many examples of sites that adapt between desktop and mobile without a redirect. There’s also a backlash. I’m intrigued by that. I feel there is an element of “tail wagging the dog” about CSS driving more sweeping experience changes. I’m not sure CSS is the place for something that feels like conditional logic. The width of left and right columns being 15 pixels OR more that that, and implicitly how wide that central ‘content’ column is. 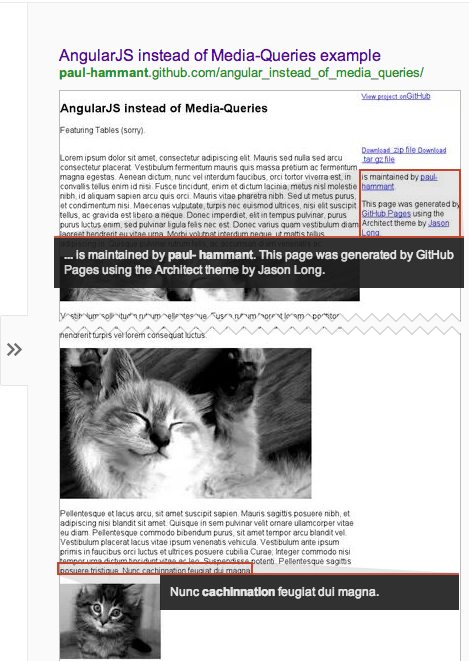 By the way, the source on GitHub is – https://github.com/paul-hammant/angular_instead_of_media_queries. The actual deployed site is http://paul-hammant.github.com/angular_instead_of_media_queries (be sure to try this on mobile devices as well as desktop … and try resizing the window). There’s content that disappears from the left and right columns (as they get smaller). 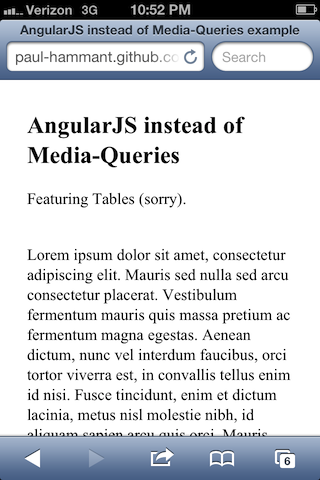 There’s also a point at which those columns function as margins (min width 15px). It all works quite well. The three columns are implemented in regular HTML tables. Yes that technology, that was superseded by <div> elements (and CSS) some ten years ago. How does google index this site? What does it look like in preview? 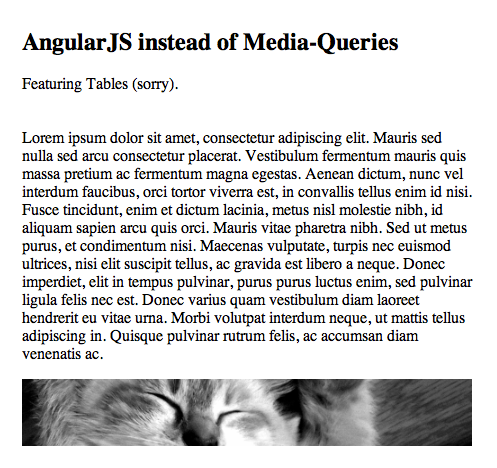 ph7785:angular_instead_of_media_queries paul$ ack " ng-"
OK, so that’s not 100% clear, so take a look in the source, and scroll around. I’ve also put the word ‘cachinnation’ in the page, so that I can search later for it in Google-Search. Well, search for “Paul Hammant cachinnation” perhaps. Cachinnation means ‘To laugh hard, loudly, or convulsively (guffaw)’. Looks OK, right? I’m not sure what’s happened to the left-hand column. Maybe the preview maker trims whitespace at the margins. By the way, it took the Google search-bot about seven hours to find it and make the preview picture. There is some suggestion online that the word ‘responsive’ should mean Media-Queries solutions exclusively, so I’ve been careful to minimize use of that.